You surely know what a trend is and you know that you see them on your charts over and over again. The trend is a core principle of the forex market or any market for that matter and should always be taken into account when constructing your trading system. It is always easier to trade with the trend than against it. A trend signifies that the majority of traders decided to push the price in one direction. You must always know what that direction is and trade in line with it. If you want to know everything there is to know about forex trends, how to spot them by reading the price action, how to recognize when the trend is changing without the help of any technical indicators, you can check out the book Follow Price Action Trends that explains this in great detail, with many chart illustrations, and puts it together into a complete forex price action trading system that can yield thousands of pips by trading these changes in trend. 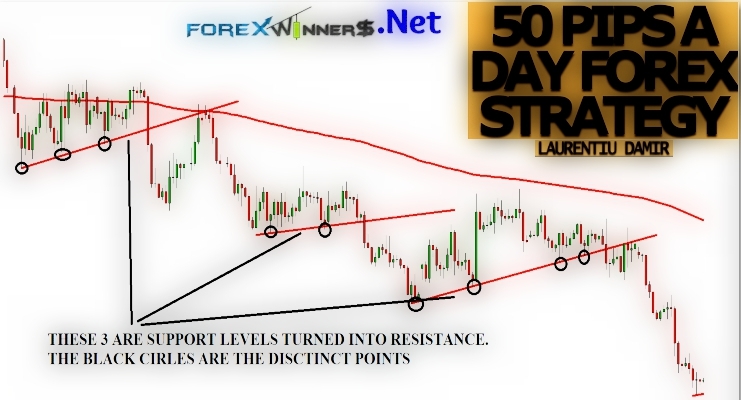 Support and resistance levels are also a key component of the forex market; a large number of traders out there emphasizes them on their charts and base their trading decisions on them. Therefore, it is advisable when you decide how to construct your trading system that you take them into account. Fibonacci ratios are another forex tool that works extremely well in the forex market. Just pull up any chart and draw your Fibonacci Retracements levels from the start to the end of any big move in one direction or another. You will see how many times these levels act as strong support and resistance zones where price bounces back to resume the previous trend. Price patterns and candlestick patterns are also very popular with the vast majority of traders therefore, they too have a great rate of success. Price patterns are used as signals that price is preparing for a move in a direction and candlestick patterns are used mainly as a confirmation when entering a trade. If you want to learn in great detail about all of these above powerful trading tools and master them, you can take a look at the Trade the Price Action book that explains them very well with many chart illustrations and puts them together in the form of an extremely powerful price action trading system. In conclusion, these are the things that you should include in your trading system because there are by far the most successful tools to trade the forex market. It is completely up to you to decide if you combine them all in your system or just use some of them. There will be more about these powerful tools in a later section where you will learn how to avoid making trading mistakes when working with them. From my experience, this moving average is the only indicator that is worth incorporating in your trading system. It is the most important moving average of them all, all retail and professional traders keep an eye on it therefore price tends to bounce when it touches it. However, it is best to use it in your trading system as guidance, as a confirmation of what price action tells you and not as a tool to base trading decisions on. For example, if your system is designed for the 4h chart, you will want to read the price action on that chart to know what the trend is. After you do that and see that the current trend is up or down, you can then look at the 200 EMA on the same chart to confirm and enforce your price action reading. Let us say the price action trend on that chart is up. If that specific forex pair trades above the 200 EMA at that time on the same chart then you have a confirmation of your price action reading. You can check out the Trade the Momentum book for a complete trading system that uses this moving average along with some other powerful concepts of trading to make 200 pips per week or more.